This is my 3rd Sonicare toothbrush, and I've been a big fan so far. I bought this one because my existing model had the problem with stuff building up inside the brush head and it was very hard to clean out. I agree with all the positive reviews as far as the improved design, lighter weight, more options, and it's much easier to keep clean than the previous model. However, the metal shaft on mine came loose within a few months and got so bad that I finally called Norelco service. I gave them the model number and serial number and they immediately offered to send a free replacement, with a postage-free box in which to return my broken one. That was over two weeks ago, and it hasn't arrived yet. I phoned back a couple days ago and was told it was on back-order and should arrive within a few more days. The service representative was friendly and I didn't have to wait long on the phone, but I have noticed that several other reviewers here on Amazon have had the same problem I have had. I'm wondering how long my replacement will last. So, when it worked, it was excellent, but it should not have broken so fast and the replacement shouldn't take so long to be shipped from Norelco. Meanwhile, I'm using my old model which I'm glad I didn't throw away. It still works fine after more than two years. This is my second Sonicare product and I remain very impressed. I previously used the Elite for two years and my only annoyance was the design of the Elite brush head and handle. The Elite brush consisted of a screw-on dome that no matter how hard I tried to keep it dry and clean on the inside, it would always get dirty and gross and there was no way to clean it. Similarly on the Elite handle, a deep well that the magnet from the brush head would insert when brush and handle were joined would also collect dirt and was impossible to keep clean. This wasn't a health issue but it was just gross to look at when you disassembled the brush after each use. I found that if I didnt disassemble, a black mold type substance would grow. Even taking it apart after every use would not deter this growth eventually. The new Flexcare brush fixes all of these issues. Gone are the deep crevices and unreachable traps for dirt and moisture. The brush head simply inserts onto a pin on top of the handle. The handle on the Flexcare is smaller than the Elite. As for the reduction in sound and vibration, I can't agree with the packaging because it sounds and feels the same as the Elite to me. There are many more cleaning modes however I just use the clean mode as I did before. Both products clean my teeth nearly as good as the dentist. I always thought an electronic TB was a waste and was finally convinced by my dentist to try one. If you never have used one, you will be amazed at the difference from a manual brush. It takes some getting used to but you will see and feel the difference. See for yourself. After a couple of weeks try a manual brush and your mouth just doesnt feel clean at all. The package contains a charger, travel pouch, travel charger, UV brush sanitizer, 1 regular and one small brush head. My only gripe is that the travel pouch is soft where the Elite had a hard plastic case that held and cradled both the handle and brush. The new cloth pouch offers no protection from crushing or keeping the brush from hitting and possibly scratching the handle. Excellent upgrade from older models. I have owned the 2 prior models of this brush. Although not all of the updates are great, most of them are. No more obnoxious gunk between the brush head and the handle! The charger is better designed and easier to keep clean. The battery seems to last forever, even when the indicator lights claim there isn't much power left. Most importantly, the brush leaves you with a cleaner and cleaner feeling mouth and than before. I have used an Oral-B sonic toothbrush for several years. I have been quite happy with the results I get from it. I wondered whether there is something better so I selected this toothbrush. Quite simply, I am amazed. The first thing I noticed is that this toothbrush is lighter. Second, the head has a thinner stem than my current toothbrush, making it easier to maneuver around my mouth. Third, the toothbrush seems to hold a charge longer than my current toothbrush, and it seems to hold one longer than when my current toothbrush was new. Fourth, this thing is loaded with settings. This toothbrush features three two-minute cleaning modes that are selectable from the handle. The most vigorous mode is "Clean," followed by "Sensitive," and then "Massage." As you are going through the routine, a beep sounds every thirty seconds to let you know to move to another quadrant in your mouth. The toothbrush shuts off automatically at the end of these modes. Two other modes serve other purposes. GoCare is a one minute routine for quick cleanings between regular brushing. MaxCare features a two minute "Clean" period followed by a one minute "Massage" period. I like this brushing mode the best. Some people may find the various modes to be overkill. I personally like the MaxCare feature and the ability to choose between "Clean" and "Sensitive." Those choices may not seem like a big deal until you have oral surgery. I do not use all the modes, but who knows, some day I might. The Good: Easy to maneuver around your mouth with the slender head. The charge lasts a long time. This model has lots of features. The Bad: Whoa! This model is expensive. Most sonic toothbrushes are expensive when compared to your typical manual toothbrush, but this one seems expensive for what you get. I confess that I really like this model, but I struggle with the price. Also, all that money and only one brush? Wait until you see how much replacement brushes cost! There are a lot of ways to brush your teeth. Sonic toothbrushes are nice because they help massage your gums in addition to cleaning your teeth. The built-in timer is nice too. However, you have to justify spending quite a lot on this model, and then spending even more on replacement heads. I love this model and will use it until it breaks, but I doubt I will purchase anything as fancy (read expensive) to replace it. The four stars are for the features. It would have been five stars but for the price. for several months and didn't expect I would need time to adjust to the FlexCare's clean mode. The brushing instructions for the FlexCare differ from those of the Ultreo: without the waveguide that that Ultreo has, the FlexCare is easier to adjust to. I felt comfortable using the FlexCare the first day, whereas (as the Ultreo instructions say to expect) it took me a week to get used to the Ultreo. 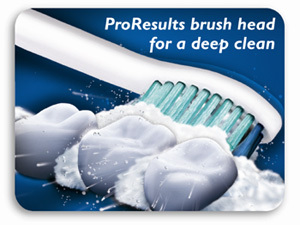 My teeth felt clean after brushing with the FlexCare, at least as clean as with the Ultreo. I did prefer the handle of the Ultreo a little, it seems to balance and fit better in my hand. I still haven't gotten used to the placement of the FlexCare's on/off button and every few days I accidentally stop my brushing too early. What is more of a concern for me is that after using the FlexCare, I've felt a return of some sensitivity along my molars that had gone away when I used the Ultreo [I have a dry mouth condition and have to take extra care of my teeth including more frequent brushing, use of a WaterPik, a brush pick, and a mouthwash]...and when I have switched back for a few days to the Ultreo during the past month that sensitivity went away. Whether that was due to some benefit of the Ultreo it is too soon for me to say. I had one dental cleaning after using the Ultreo for one month and one more after using the Ultreo another two months and then the FlexCare for most of the last month (sometimes using the Ultreo) and both times the hygienist was pleased overall with the condition of my teeth and gums. Note: I haven't been using either the Ultreo or FlexCare long enough to have a certain preference between them myself. I haven't used any other electric toothbrush currently on the market. Starting with the Ultreo and getting used to it may have biased me in its favor. I can't tell yet if the Ultreo's ultrasound makes a difference so I don't know if it is worth adjusting to having the waveguide (and extra expense of the brushes). At this point, if I had to recommend one to a friend who did not have special dental needs, I might recommend the FlexCare but if someone had a dry mouth condition like mine I might suggest the Ultreo. But I am not a dental professional nor do I have the benefit of long-term controlled studies or even any long-term usage of my own. I'll go back to using the Ultreo now unless a future cleaning indicates problems and if so I'll try the FlexCare again ... but if I had started with the FlexCare it is possible I would have gotten accustomed to it and after reviewing the Ultreo I'd be going back to the FlexCare for now. Either seems preferable to me to using a regular toothbrush and there's been some improvement in my gums since using each that there hadn't been when I was using a regular toothbrush (even attentively). I love this toothbrush. One thing that really made the difference for me is the fact that there is significantly less vibration that other products I've used so far. Believe me, I love the tickle I get from holding the brush handles of my Ultreo Ultrasound, but after a while it gets irritating. What the makers of FlexCare have accomplished is to practically eliminate this buzzing in their product (by as much as 80% according to the statement on the box). Another interesting feature has to do with the bristles. I feel like I'm reaching some parts of my mouth a lot easier and I believe it has to do with the fact that FlexCare offers a wider sweeping motion and the bristles are more rounded than the average toothbrush. This combination makes for a more pleasant experience when after turning off the bathroom light and heading to bed, I feel refreshed. I guess the toothbrush does make a difference. What in the world could I lose? Obviously, I wasn't very optimistic that any brush could adequately clean teeth that make my good dentist heave a resigned sigh but I learned! The smaller brush head is perfect for reaching those previously annoying spots that could only be reached by a dental hygienist. That was more than enough for me but to have three brushing modes - clean, sensitive or massage, and a timer, well, this is simply the best electric toothbrush I've used. 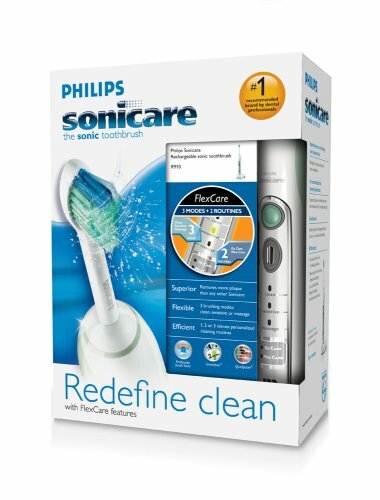 My wife and I have been using the Philips Sonicare Rechargeable Toothbrushes for several months. My wife has been using the model sans UV Sanitizer and has been pretty happy with it. The rechargeable base is interchangeable with the higher end model (which includes the Sanitizer), allowing my wife and I to share a unit (and give us more bathroom counter space). This particular model offers the same three modes of brushing that the higher model does. Initial setup involves plugging the base unit into an AC outlet and letting the brush charge. The toothbrush easily fits into its charging unit, and does a thorough job in cleaning our teeth and gums, especially in harder to reach places. The three modes are easy on sensitive teeth, and apply enough pressure to clean the gums without causing them to erode. The unit itself is easy to clean and maintain, and appears to be well thought out in terms of both holding the toothbrush, as well as placement of the mode buttons. This is the third electric toothbrush I have tried in the last year and this one stands heads and shoulders over the other two. The first I tried was the Ultreo Ultrasound Toothbrush which always felt awkward and replacement heads were expensive and not in my local stores. On the other hand, the Phillips Sonicare just seemed to fit the first time. Perhaps I am more adjusted to the feel of electric toothbrushes, but this one did not feel like I was brushing with a tennis racket. Also, replacement brushes are readily available and reasonably priced. The second brush I tried was the cheaper Waterpik Sensonic Professional Toothbrush, which I was very happy with it. But a few friends kept raving about their Sonicares so I figured I better try one. The Sonicare probably costs twice what the Waterpik costs but it's worth it. It was kind of like driving a BMW when you are used to driving a PT Cruiser. The Waterpik was good and got the job done, but this brush just had a feel of quality. I want to stress that this brush works superbly. My 3 stars are for the value/bang for your buck aspect of this product. I have used three other electric brushes besides this one. One was a very early model Sonicare, the other two were Braun Oral-B models. ALL of them worked great. The three other brushes I've used have all had excellent durability. And I never had a single cavity with any of them. There are really just two major differences between these two brands. Brauns tend to have smaller heads and they have a kind of rotating pulsing motion. Sonicare models have more of a vibration motion and, in my experience, tend to tickle a bit more. Your mileage may vary. In my experience, Braun brush heads also tend to be a little cheaper. All the electric toothbrush makers make claims about being the "best." However, as one major dental site commented, "There are currently no studies that we are aware of that compare objectively electric toothbrushes. The choice is really a personal one." If you look at multiple objective dental sources you'll find the same kind of advice - choose according to your own preference, not the PR spin of the companies making the brushes. This specific model has 3 cleaning modes, 2 "routine" modes, 2 minute timer, a quad pacer (30 seconds per quarter of your mouth), and a few other lesser features. The thing is, all of these exist on many other brushes, many of them about $50 (or more) cheaper than this one. If you're looking for just a good electric brush then I can't recommend this model. For about $50 less you can get, for example, the Braun 8850 . . . or the Sonicare e5500, to name just two. They both have most of the exact same features as this model. For the exact same money you can get the Oral-B Triumph 9900 with Smart Guide. That model tells you, graphically, when you're brushing too hard (which causes major permanent gum damage) and when you need to replace the brush head. Those are the kind of extras I'd be willing to pay for. All the extra modes and timers I find to be a bit useless. I have never used an electric toothbrush before this one - the "old-fashioned" way always seemed just fine. But since our dentist has recommended that we use a sonic toothbrush (he made no specific brand recommendations) I decided to give this a try. Another reviewer has compared this brush to a "bee" in your mouth. I'd say it's more like a jackhammer - at least to begin with. It took several days and some adjustments to my brushing style before I started to get used to it. I still find it annoying and almost painful when the shaft of the brush head accidentally touches my teeth but with practice I'm getting better at avoiding that. My previous habit was to brush for a very long time, but this model gives a slightly different buzz every 30 seconds to prompt you to change which part of your mouth you're brushing. I've gotten used to that as well, and am able to time myself a little better now so that I've covered all the teeth in each section. It still feels like it stops rather abruptly, however, when the 2 minutes are up but I guess I can always turn it back on, right? Unfortunately, us "low-tech" brushers don't get up to speed so quickly, and I'm still trying to figure out all the features this brush has, but it seems to work well on the standard setting. A valuable addition to your dental routine. - Brush body is light and highly portable. Many competitor models that offer comparable brush speed/features tend to be bulkier. - Decent clean and polish. The model claims to be better than competitors, I have no way of verifying this claim myself. 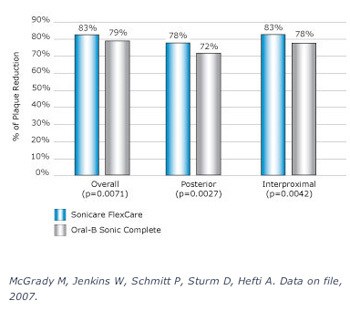 However, I find the brushing result to be at least as good as higher-end Oral-B and the WaterPik Sensonic. - Essential timers - 2-minute brushing timer and 30-second quad timers. All other models have them, it is good these essential features are left untouched. - Portable, all-voltage charger that's perfect for international travelers. While we are on the subject, folks who tend to travel internationally and are shopping around for a power toothbrush, should pay particular attention to this minor detail. Many models do not have international charger. - Too many useless modes. Speed setting is good, but I feel Philips has taken this too far and came up with a list of different "cleaning modes". Basically, all these modes are nothing but pre-programmed sequence of speed/time settings. Most other models have one button where you can toggle between the speed modes. Realistically, that's all I need. I don't need these cheap, cheesy, and completely useless simple IC logics. - Price. Perhaps due to all the cleaning modes, this brush is priced at 130+. IMHO, there are equally good models you can buy for much less. - Only one brushhead included in the package. Come on, for around 140 a pop, you can't throw in at least a pair of brushheads? Packaging: The packaging of the device was appealing and organized. The pictures and the white coloring definitely inspired cleanliness. The listing of the features of the toothbrush on the box was short but still informative. Portability: The toothbrush comes with a travel case that is compact enough to fit in most toiletry bags, however, the brush head needs to be detached in order to fit in it. The charger is very compact and readily able to travel. Operation: The R910 features 3 brush modes: clean, sensitive, and massage. The clean mode was very intense and takes a little while to get used to, however, once you do it is definitely the most effective mode. It gets teeth very clean as the vibrations are at a significant amplitude. The sensitive mode is a good compromise if you have very sensitive gums. While it does not clean as thoroughly as the clean mode does, it is sufficient for daily use. I would personally not recommend using the massage mode. I felt that it did not make my gums any less sensitive than the sensitive mode, but the difference in cleanliness was noticeable. The R910 also featured timers and personalizeable routines which I didn't find useful. I have used other Sonicare products for a number of years, but have found that this unit easily surpasses other products. It has great features, is very easy to use, and most importantly, seems to leave you with feeling that your teeth are very clean. The unit and charger are quite compact (and the charger has a base that can be removed to make it smaller for traveling) , so don't take up a lot of counter space. As a result, the toothbrush is quite manueverable and easy to use, an important feature if you use it for the recommended 2 minutes. The toothbrush is very easy to use, in that you basically push a button to descide which of the clearning modes you want to use (basically there is a 2-minute clearning cycle, with the option of a one-minute quick clean or a3 minute cycle that works in a minute of gum massage. There is also a light that indicates how well charged the battery is. One nice feature of the toothbrush is that it briefly stops (i.e., for a second) as you brush to remind you to move the brush to another quadrant of your mouth, helping assure that your brushing is complete. After two minutes, the unit shuts off. This is an excellent product that does a great job and is easy to use. It really helps meet your brushing needs in that you can set it for different lengths of time (also there is a setting for sensitive teeth). The feature that tells you to move the brush to another part of your mouth is very helpful and really makes it easy to give your teeth a thorough brushing. Having been a longtime Oral B user the claims that were made about this brush were enough to make a Vine request. This is an excellent though noisy system. Though working at sonic frequencies it does not celan any better than its slow predecessor, while being very noisy. I have been using the Sonicare Elite 7300 brush for a couple of years now, so it was no surprise to me that the FlexCare line is also a very good brush. All-in-all, using the new FlexCare is not all that much different than the Elite series, it feels about the same despite the advertised 80% less vibration. That being said the vibration does not bother me at all. The two biggest differences I noticed with the FlexCare are the significantly smaller handle size, which could be good if you have smaller hands and the somewhat larger brush head size, which I kind of like, because it seems to clean more areas faster. Of course the new ProResults brush head also means that I can't use the same brush heads that I have already bought for my older brush, but I like the new head design and also the way that it just presses on instead of screwing on like the older heads did. As for all of the brushing modes and cleaning routines offered with this brush, I have not even bothered with them, I like brushing my normal 2 minutes (30 seconds each quadrant) which is what the standard clean mode does, so that is what I use. The charger station is also nice because it can hold two extra brush heads so that up to 3 people can share the same space easily. It also has a "travel charger" which is just the main charger without the extra brush head spaces and also a cloth-like travel case. The battery life also claims to be longer than any of the previous versions, so taking this on longer trips without even worrying about the charger is more of a possibility. I've tried just about every electronic toothbrush on the market (Sonicare Elite, Braun, Ultreo, and Waterpik), and the new Sonicare Flexcare beats them all. 1. Using the regular setting for a two-minute brush leaves my teeth feeling clean, the cleanest of any of the brushes I've tried. 2. Multiple power settings include a low power gum massage that's just great. This massage feels as though it stimulates blood flow to the gums, and that just has to be helpful. 3. Plus, for new users, there's an Easy Start program built into the brush that allows the brush speed to start slow and increase in power over several days. For users familiar with electronic brushes, however, starting with the regular (full power) setting won't be a problem. 4. The charger is solid and heavy enough to avoid the tipping over problems I've experienced with some other brushes. And there's a place to conceal the excess wiring beneath the charger. 5. The replacement brushes are reasonably priced. I won't be spending the price of a new setup every year just to get new brush heads. And I appreciate the fact that Phillips is not holding their customers hostage for replacement brush heads. I've had this toothbrush since June, 2008. I bought it when my old Sonicare's battery died. I had the old Sonicare for 3 years and liked it very much--it did an excellent job cleaning my teeth. Unfortunately, this new Sonicare does not seem to clean my teeth as well as the old one, especially where two teeth meet and up by the gums. I think this is because of the brush shape. It seems too rounded for my teeth and the bristles on the edges of the brush seem too short. I get my teeth professionally cleaned every 6 months and, at my last cleaning, I was surprised to have some tartar on my teeth (usually I do not have any, or I only have a very small amount). They do sell other brushes for this toothbrush aside from the one which I am currently using (which is the model of brush that comes with the toothbrush), but these other brushes are very small and I also find that they do not do a very good job cleaning. I really wish they would make some of the old-style brushes to fit this Sonicare. I also think that this toothbrush is overpriced (I paid 89 dollars). There are some things that I do like about this toothbrush. I like the long battery life and I like the fact that a lot of grime does not build up where you attach the brush head (which was a problem with my old Sonicare). It's also nice that there is a built in timer which alerts you every 30 seconds so that you can change quadrants while you are brushing your teeth. I do, however, think it's silly that it shuts off after 2 minutes (my old Sonicare did this too) because I am often not done brushing my teeth. The massage function is okay. I tried it, but do not use it because you have to set the toothbrush up for it before you start brushing (and I always forget). The only reason that I would be interested in going through this extra step would be because it adds 1 minute to the overall time of the brushing cycle (so the toothbrush would not shut off before I was done brushing and I wouldn't have to turn it on again to finish). This model uses a lithium ion battery (the HealthyWhite also uses Li-ion). This is the reason I chose this product over oral B or the other cheaper sonicare models. All the Oral-B models that I could find used either NiCad (toxic) or nickel-metal-hydride (NiMH). Previous experience with NiMH batteries that they wear out quickly. And since you cannot replace the batteries in rechargeable toothbrushes, I didn't want to have to purchase another one in 2 years. I've had very good luck with Li-ion batteries in laptops, cameras, phones, etc. They hold their charge better and last longer. Justifying the price is difficult. Although I got a very good deal at a warehouse store for the flexcare with 2 handles and UV sanitizer. The replacement brushes are also more expensive. However, if I can get a few more years out of this because it uses a better battery, then the price will be more comparable to cheaper models. I wish I had one years ago! This is a fantastic product! My hygienist has recommended a Sonicare tooth brush for years and finally I got one. It is so easy to use and you actually get better results in less time, so it's very efficient. My problem area is behind my bottom teeth; even with a regular tooth brush I just accepted all the plaque build up all these years! I am 28 now and it's time I started taking better care of my teeth and gums. Since I have been using this Sonicare toothbrush with regular flossing and mouth wash, I have noticed that my breath is fresher, even in the morning and for some reason I don't get headaches often like I used to, so I give credit to having excellent oral health. This product is a must have for your health and smile! Yes. The other reviews are Right - Its AWESOME. Recently I had been seeing (actually feeling with my tongue) plaque deposits on my teeth and decided to try out a power-brush. Being a kind of buyer that believes in spending a little more but getting the best product I finally bought the Flexcare toothbrush. While reading reviews that said "feels like dentist clean" I was like yeah right, as if its really that cool, its essentially a vibrating toothbrush! But, I was so damn wrong :) The first time I used it, immediately I could feel that "clean gap between the teeth", just like you do after flossing. It was such an awesome feeling that immediately I felt nice spending $100. I had originally given this toothbrush a five-star review. It's compact, quiet, and works like a champ. Until it broke after only eight months. I called Philips and to their credit got a Customer Service rep who actually sounds American. I could understand him! They promised to send a replacement unit under warranty, but that was more than two weeks ago. I called today to see what was going on and was told replacement units were on back order and -- "we'll send it to you as soon as they come in". And when might that be? I'm going in for a checkup with my dentist tomorrow, and I don't think he will be happy with what he finds. At least I can blame my rotting gums on this unreliable toothbrush and Philips' sluggish warranty service. This Sonicare electric toothbrush is, simply put, an excellent product. I've been using a Braun (which I believe is the same as Oral B) electric toothbrush for years, and it does not compare with this newest generation of dental hygiene products. This model comes preset with a step-up program that gradually increases the speed of the brush head over 14 uses until it reaches maximum effectiveness, a feature designed especially to those new to electric toothbrushes. Although I've used an electric toothbrush for years, I decided to try out the pre-programmed sessions to see how it worked. On the first day, the toothbrush sounded like a bee in my mouth; it was gentle, with enough high-speed vibration to clean my teeth better than my old, full-speed Braun. Over the fourteen uses -- I did it in a week, but those new to electric toothbrushes might want to use it only once a day at first -- the brush lost its whine and gradually moved to its final, more authoritative vibration that cleans exceptionally well. Even at maximum power, this toothbrush does not vibrate through my entire skull the way my Braun does. The coolest part of the Sonicare is the option of selecting different modes. The sensitive teeth setting is more like a mosquito than a bee; although I have sensitive teeth, I find that the regular cleaning doesn't bother me and is more thorough. You may select "Go Care" (a one-minute touch up between regular brushings), "Massage" for the gums, and MaxCare for a 30 second tooth brushing following by a fifteen second gum massage for each quadrant (total time = 3 minutes.) To remind you to switch "quadrants" of your mouth, the pitch changes slightly. After the routine time is up, the toothbrush stops. First time electric toothbrush users should note the instructions about angling the brush head and moving gently side to side. You do not move the brush much yourself as you would with a traditional tooth brush; otherwise, you'll irritate or even rip your gums. My dentist has always advocated using an electric toothbrush once a day, not twice, with a traditional brush doing the work for the second brushing, although I find that the Sonicare, unlike my old Braun, is gentle enough to use twice. Still, users might not want to throw out their toothbrushes. I have only two complaints about this product: you cannot attach it to the wall to keep counter space free, and the automatic stop feature is annoying if I'm not quite done brushing. The inability to mount it on the wall is especially frustrating since the handle is incredibly easy to knock off the charger. Some people might not like the fact that it tickles like the Dickens when you hit the roof of your mouth while on the brushing speeds. I highly recommend this toothbrush. Electric toothbrushes promote oral health through both cleaner teeth and gum stimulation, and the Sonicare is an exceptional entry into the market. Since there are many other reviews, I'll just mention the highlights. I've been using the low-end Sonicare model for years and was happy with it, except for poor nickel cadmium battery life. It was annoying to have to throw away an expensive toothbrush because the battery would no longer charge. I'm hoping the lithium ion battery in this model will last longer. This model does seem to get my teeth cleaner. It feels like it's doing a better job, and after getting used to it the low-end model feels really wimpy. I like the LED battery indicator because I travel a lot and don't have to guess about when the toothbrush needs to be charged. My only complaint about this toothbrush is that it has some useless features that annoy me. For example, it turns itself off when it thinks you've brushed long enough. I always have to turn it back on. It's not a big deal, just dumb. There doesn't seem to be any way to disable this feature. The instructions indicate you can disable the "Quad pacer" feature, which I did, but the toothbrush still turns itself off. For a toothbrush in this price range, it's surprising that it doesn't come with at least one extra cleaning head, or a holder for the spare heads. Phillips sonicare flexcare tooth brush is the best I've ever used! For those you of you who are in need of help choosing a sonicare toothbrush your search is over! This is the best electronic toothbrush i've ever used. I have used an older braun oral-B that crapped the bed after only a month of use! Not sure what happened there but that brush was decent. Then came the oral B vitality. What a worthless brush that is. Yes, it's cheap but you don't get half as many rotations as you would with the older oral-b models. Can't forget after a year of use I was lucky if the charge would last a full week without having it sit in the charging cradle. You could also tell as the days went on that it was losing it's power. That Being said here are the pro's about this toothbrush: Smaller head then of the past sonicare toothbrushes. The charge definitely lasts more then a week without charge! I would say it would last just about a full 2 weeks without it sitting in the charging cradle. 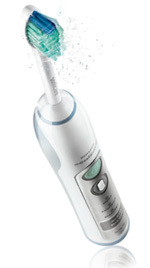 2- compared to my oral b, i really love the "sonic" action you get with the toothbrush. I've had stuff stuck in my teeth plenty of times and instead of using floss(which is a better choice) i just use the one minute"go care" selection and bam, it blasts it away!. 3 you may not find this important, but the battery indicator is a luxury. I didn't have this with my past electric toothbrush, and without warning would have a dead toothbrush half way through my brushing! 4 All the different modes. When i say modes i really mean the "clean" , "go care" and max care" i believe these are the best and most used. The clean mode is for 2 minutes worth of cleaning, go care as i've mentioned above is for a brief 1 minute brushing for in between brushings, and the max care is my favorite- three minutes or 2 1/2 minutes of cleaning. 2 minutes of regular cleaning with about a minute extra of messaging. I can't forget the great feeling you get AFTER using this toothbrush. You get that just been cleaned by the dentist feeling- Nice and smooth every time! 2- the toothbrush automatically shuts off! if you aren't paying attention you might not have the best teeth cleaning that day. i dont really find this to be a huge problem. If i'm having one of those days and it just turns of, i just turn it on again and finish. 3- this toothbrush is a bit pricey! Although i'm very happy because i chose this toothbrush over an older model due to the fact that this had more features, was the newest out there AND it was cheaper or about equal to the price of the older model.